I’m currently facilitating a Social and Collaborative Learning Essentials (SCLE) course for the Australian Institute of Training and Development. One of the course modules is about using social media to support learning. During this module I facilitate a slow Twitter chat. I post one question per day for 5 days about using social media for learning. For many course participants this is their first experience of a Twitter chat – sometimes their first experience using Twitter. For new users one of the challenges of getting value from Twitter is learning how to create a high quality feed of resources and conversation. Once you start following many people your feed can become quite cluttered. If your interests are varied you may find that the content jumps around from one topic to another as you scroll through your feed. Twitter lists can help with this challenge. If you prefer to follow written instructions for using Twitter lists you can refer to the Twitter help centre. For some useful ideas about how to use Twitter lists to improve your engagement with others look at How to Use Twitter Lists to Follow Thousands (and Appear Superhuman). Note – I hate the title of this article. For me the quality of connections and engagement matter a lot more than quantity and appearances. However, the ideas for using lists are solid. Jane Hart runs an annual online survey of learning professionals to identify the Top 100 Tools for Learning. Twitter has been voted as the No. 1 tool in this survey for the past seven years. In the past two years it has transformed my professional development, and I take every opportunity to encourage others in my organisation and profession to use Twitter. In this post I share some approaches and resources that I have used to help others to get started with Twitter. I have run informal group sessions inside my organisation, and a pre-Conference ‘learning lounge’ at the 2016 Australian Institute of Training and Development Conference. Recently I’ve included resources on why and how to use Twitter in a self-directed micro-learning program created to build digital and network skills and habits in my organisation. Additionally, on-the-spot opportunities frequently arise to discuss Twitter and show people how to get started. To the uninitiated, Twitter, along with other social media platforms, can appear to be a place where people go for gossip, celebrities and cat videos – in short, a waste of time. This is why it’s important to focus on the WHY and bust some myths before moving to the HOW to use Twitter. This is as true for group presentations as it is for spontaneous discussions. Helen Blunden of Activate Learning Solutions discusses this more fully in her blog post How Do You Start Out in Twitter? Find the Why First. I ran my first one hour Twitter workshop as part of a ‘lunch and learn’ professional development series in early 2015. I searched for existing resources and found Helen Blunden’s post on How to Promote Twitter for Professional Development to Your Colleagues. I downloaded her slide pack, updated it to reflect changes to the Twitter interface since her post, and customised it. Customisation included stories of my own experience and the opportunities that had been created actively engaging with others on Twitter and building my network. I included Twitter profile pictures of the people involved in my stories, explaining how I had built my relationship with them and the way we had collaborated. This was the most powerful part of my presentation as it illustrated the spirit of generosity and reciprocity that can be generated in online networks over time. I could see the light bulbs going on for people. I also identified Twitter accounts relevant to my audience so I could suggest useful people and organisations for them to follow. See Helen’s post for tips on how to promote and attract people to your event. During the session I moved between the PowerPoint material, demonstrating things on my laptop, and supporting people to try things out on their laptop or devices. I had another experienced Twitter user present to help support people – it’s important to have enough support to get people hands-on during the session. You can view my presentation below and download it to update and customise it if you would like to use it. If you compare it to Helen’s presentation you’ll see where I have re-used versus customised content. The AITD invited me to run an informal 30 minute ‘learning lounge’ on the morning of Day One of their 2016 conference. The intent was to encourage and equip attendees to join in the conversation on the backchannel. What a great initiative! Instead of just telling conference-goers that they should use Twitter, it equips them to get started and gives them an active conversation to join in so they can see benefits immediately. I was unsure how many people would attend a session at 8.30am prior to Conference kick off. The session had been included on the conference agenda, and one of the AITD team told me that whenever they responded to a query about the conference they had encouraged people to come along. They must have done a good job at this – there was around 80-100 people at the session! I checked existing Twitter experience with the group and what they hoped to get from the session. It was great to see some active users who had come to support those new to Twitter. Others had signed up several years prior, but not known how to use the platform effectively. Several people did not yet have accounts. So, a mixed group. Instead of using a slide pack I demonstrated directly from my iPad which I projected using a lightning to VGA adapter (a little pricey at AUD$75, but a useful tool). I chose to project from a mobile device rather than a laptop as attendees would be using mobile devices during the Conference. My goal was to quickly get people comfortable enough with ways of engaging with others on Twitter (e.g posting, replying, retweeting, quoting tweets, using hashtags) that they would follow and start participating in the #AITD2016 backchannel. You can download the session run script. I followed it fairly closely and found that it flowed well. I had been concerned that there wouldn’t be enough content in the backchannel before the conference had started to demonstrate some of the functionality so had asked some of my Twitter buddies to post. It turned out there was plenty of content to use, so it was easy to demonstrate everything in the script. I only just got through everything on the script in 30 minutes, and didn’t have time to check that novices were hands-on trying things as I demonstrated. I did offer to provide individual help to anyone who needed it after the session, and provided a job aid for iOS mobile devices. Note that the Twitter interface does change over time, so suggest you check this job aid (created May 2015) before reusing it. Although not in the script some people were interested in how to use Twitter lists, so I demonstrated this in an extra five minutes at the end of the session. Lists are a very useful filtering mechanism, although a little advanced for an introductory demonstration. In my organisation we have been developing a self-directed micro-learning version of our Work Connect and Learn program. This program aims to build digital, networking and knowledge management skills and habits. Program ‘modules’ are shown below. The list of topics and links to curated resources is below, followed by the suggested activity. Have you used any of these approaches to encourage and support people to get started using Twitter for professional development? Perhaps you’ve used other approaches? What are your observations and tips? Please leave a comment in reply. I enjoy it when someone shares a useful tip, tool or resource with me. If they’ve thought carefully about my interests, know what’s relevant to me, and offer it to me in a “place” that’s convenient to me, then it’s a great gift from them. This helps me to think about what and when to share with my team – to do it in a way that my sharing is a contribution and not noise or a burden. I am also very conscious that I am role modelling new behaviours within my organisation, so want to help people to see the potential value in sharing by doing it judiciously and well. 1) Verbally or in email with an individual or small group – a resource relevant to the specific topic or context e.g. an article on why measuring performance impact is more important than ROI shared directly with a team member who was designing a new evaluation approach for a learning program. 2) Posting a link on Twitter and @mentioning specific team members – this works where the team members I want to share with use Twitter (4 out of the 12). I thought I had done this several times, however when I did an advanced search on Twitter for examples I could find only one where I shared an article on leadership styles in different cultures with a team member who does a lot of work in Indonesia. 3) Posting a link or message about a resource on SharePoint newsfeed with a comment about why I am sharing this link – this is useful where the item is of potential value to a larger range of people in the group. In the example I highlight a case study on the 702010 Forum in which we have organisational membership. I don’t share resources in this way very often (despite there being a lot of relevant resources I could share) and have just resolved to add this to my daily sharing habits. The other thing I could improve is to limit number of characters in post so people don’t need to click on ‘Show more’ to see the whole post, especially if links are at the end of the post. 4) Knowledge sharing sessions with the group during our fortnightly Community teleconferences – we’ve replaced status updates with knowledge sharing and learning discussions in these regular catchup sessions. Format is presentation followed by discussion. Presentations are most commonly on a topic (e.g. Gamification through badges), a work practice (e.g. how we can increase manager support to learners), or report back on ideas from an external event such as a course or a conference. I’ve also written a blog post on a topic with linked resources and asked people to read and reply to questions before the session (example shown is for a discussion on Working Out Loud). Participation in online discussion has been low and the group interacts far better in synchronous discussion than asynchronous (I hope that the Work, Connect and Learn program will help increase online interaction). This is a valuable forum for our team to Work and Learn Out Loud together, and we shall continue to use and fine tune it. 5) Diigo – I set up a Diigo account for the team to use to curate and share online resources. I am the only one who curates on a regular basis; however there are several team members who are comfortable using Diigo for joint research to meet a specific need. Below is an example of curation of research into modern approaches to learning design. 6) “Learning Links” blog posts – I have started to share short collections of resources on a specific topic relevant to the group (e.g Social learning) on our SharePoint blog. I write a short commentary about each resource and any overall themes. As I bookmark items to Diigo I tag them with “LearningLinks” if I think they my be worth including in a post at a later date. My intent had been to do a weekly Links post, but I’ve been erratic so have diarised this. I shall also start posting these collections on my internet blog in case they are useful to others outside my organisation. Diigo is at the heart of my resource sharing practices, allowing me to bookmark and tag links that I can re-use and share in a range of contexts and ways. Being able to store links in a library that I can access anywhere I have an Internet connection means that I can share good quality resources at the right moment and with the right people to create value rather than generate noise. In late March 2014 I joined my first Twitter chat. 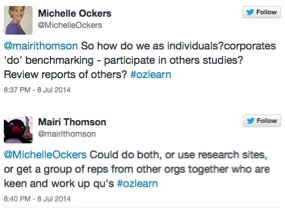 Three months later I’ve participated in a five Twitter chats with either #lrnchat or #ozlearn. Today I reviewed the published chat archives to reflect on how participating in Twitter chats help me to learn. A Twitter chat is a live, real-time moderated discussion on a specific topic that takes place via Twitter messages with the use of a specific hashtag. Anyone who is interested in the topic can join. In all of these chats the moderator has asked a series of questions on the topic to which participants respond. I’ve found the questions thoughtfully constructed and logically sequenced. During my first chat I answered questions and retweeted some responses of others. Mostly I watched, read, and got used to the format. It was a busy forum and I had to concentrate. I recognised some participants as conference speakers and authors, but was unfamiliar with most. Five chats and ten weeks later I participate actively and fluidly. I ask questions about others comments and experience, engage in side-discussions, and share resources. I am now comfortable using Twitter and my online Personal Learning Network (PLN) has grown, so I ‘know’ more participants. 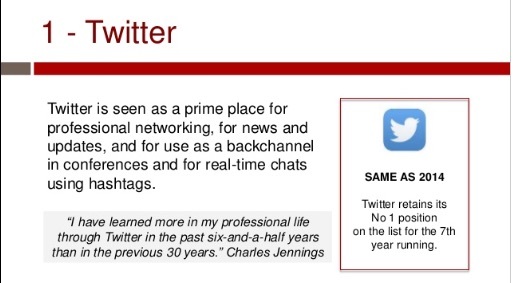 My PLN growth is in part due to chats – I always leave a chat with more people on my following and followed lists. Familiarity with other participants makes me comfortable to have a more robust discussion. While I favourite tweets to follow up after a chat, I also find chat archives useful and have started bookmarking those that I may want to refer to at a later date using Diigo. The other way in which archives are useful is where I am unable to attend a chat on a topic I am interested in. This is particularly challenging for those of us in Asia-Pacific region where chats are being hosted at times convenient to either U.S or European participants, but in the middle of the night for us. I regularly review the #ESNChat archives. I was speaking in a panel at EduTech on the afternoon of Day One and looked at the backchannel as I travelled in the morning to see if I could pick up on any themes or information that might connect to my topic. I noticed immediately how active the backchannel was – I had heard that educators were high Twitter users. Then I saw that there were 4000 attendees, so even if only 5% of attendees were tweeting across the 10 concurrent ‘congresses’ (separate conference streams) it was going to be a busy backchannel (I’ve since seen a claim that there were over 10,000 tweets at the 2 day conference). I struggled to unravel tweets from the different streams and make sense of what was going on (a plea to organisers of large conferences – stream or session-specific hashtags please!). What was helpful in the EduTECH backchannel (as well as visually attractive) was the summary of the first keynote session tweeted by @art_cathyhunt. Cathy’s sketch note summaries were so useful that they were shared in Twitter over 10,000 times and she’s published them as a collection. Cathy’s sketch notes got me thinking about the different ways in which people add value in the backchannel. Here is a list of some value-adding backchannel behaviours, with examples. Reporting – Tweeting key points made by presenters, sometimes with photos of slides. Context helps those participating in back channel only to make sense of the points. It’s useful to see the topic and presenter tweeted when a session is commencing, and when session has ended, and also a tweet when the presenter moves from one topic to another. Applying – Tweeting examples of personal application of an approach, technique or tool that the presenter is discussing, with a short reflection on the good, bad and lessons learned. Extending – Sharing links to additional resources and relevant internet sites. Reflecting / Pondering – Asking ‘what if’ or ‘how could I’ type questions to prompt consideration of how the session content could be applied. Connecting – Creating links between, for example, different conference sessions or linking the session to the conference theme. Questioning – Posing questions to the backchannel. Sometimes these are hypothetical. What I enjoy more is those that generate tweeted responses & discussion. Summarising – Summarising key themes and overall content of a session and sharing either shortly after a session (as per Cathy Hunt’s EduTECH examples) or in a blog within a few days of the session. Collating / Curating – Publishing links to a set of conference and backchannel resources. 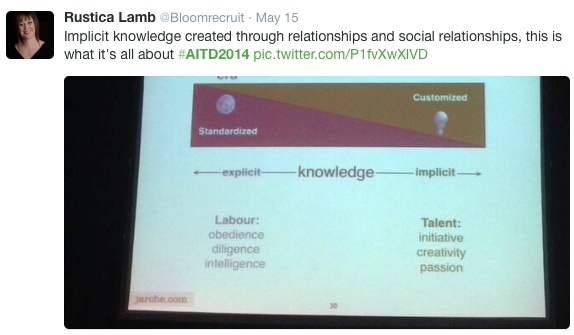 Here’s a great example from ASTD2014 curated by David Kelly. I was going to include Challenging / Provoking in this list – Thinking critically about session content and challenging the information or ideas in order to present counter-views or a different perspective. However, I couldn’t find a backchannel tweet representative of this behaviour. It’s not something I’ve seen done often; perhaps we’re too polite…..
Kent Brooks lists 10 Reasons to Tweet at a Conference, all of which ring true for me and are great reasons why I will continue to play in the backchannel when I attend conferences. Joining via the backchannel only is not a substitute for physically being at a conference, fully immersed in the sessions, discussions and interactions. I have found following a backchannel in real time a fragmented, slightly disconnected, and sometimes chaotic experience. However, summaries and curated collections posted at the end of sessions, full days, or whole conferences provide a filtered presentation of themes and resources. In effect someone else has started the sense-making process for me, making it easier for me to access the best of the conference. It’s also a great way of interacting with those in my PLN who are attending, and finding more interesting people to follow. And it’s certainly better than not being able to join in conferences that I am interested in but not able to attend. See you in the backchannel….. This week I have been endeavouring to participate in the ASTD Conference Twitter backchannel. Given that I live in a time zone 14 hours ahead of the conference location I would need the dedication of a World Cup fan to participate in real time. On Day 1 I opted for a lagged experience. On my morning bus commute (at which point Conference Day 1 was wrapping up) I scrolled through #ASTD2014 hoping to pick up some overall themes. After 20 minutes of skimming in reverse chronological order (this being the way Twitter search results are presented) I had favourited some interesting insights, mostly on design for user experience, but was having difficulty putting things together. It was like being given a few pieces of a jigsaw at a time – in fact, several jigsaws all mixed in together as Tweeters were posting from a range of concurrent sessions – and not knowing what I was missing. Also, I had only worked by way through an hour of conference tweets, and felt that my time investment had exceeded the value of what I had gleaned. It struck me that it would make more sense to work through session tweets in chronological order from the start of each session rather than reverse order. On the morning of Day 2 I tried something different – participating in the backchannel in real time. 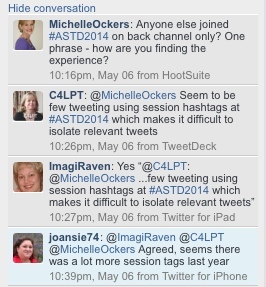 Before getting started I asked other #ASTD2014 back channellers how they were finding the experience. Jane Hart (@C4LPT) commented that few people were tweeting with session hashtags which makes it difficult to isolate relevant tweets. This explains my jigsaw experience, and I learnt that session hashtags could be used -the jigsaw pieces would be easier to sort if they were labelled. I noticed several tweets commenting on the low percentage of conference attendees who were actually tweeting, which is disappointing given that this is a large international gathering of L&D professionals. I found Mark Brit’s (@britz) comment on the value of the backchannel insightful, and decided to look for examples that met his criteria of quality, frequency, and context. So, at 10.30pm Sydney time I sat in bed and joined the first session of Day 2 – a keynote address given by General Stanley McChrystal. As it was the only session running at this time at least I wouldn’t be trying to figure out which jigsaw the pieces belonged to. In the first half of the session the tweets were predominantly informational – sharing key points being presented, with lots of photos of a slide summarising the speaker’s key points. This gave me an idea of where the presentation was heading. 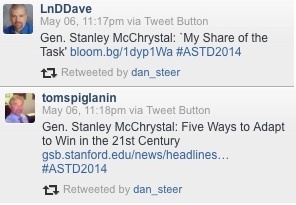 General McChrystal then started telling stories – good ones apparently. I think he told two main stories – one about Captain Sully landing an aircraft in the Hudson River, and another about the operation to capture Bin Laden. As they are both well known stories I could picture them, and I think that the main point of each story was tweeted, however any subtleties in McCarthy’s observations were not conveyed through the backchannel. I suspect that Twitter is not an easy medium to use for real time capture and sharing of a story being told verbally. I retweeted a couple of items from this informational flow, but was conscious that my followers had even less context than I did and in isolation these retweets might be of little value to anyone. I was waiting for someone to start a different kind of backchannel conversation – to discuss what was being presented, or to share additional resources. At 11.03pm it happened – @eGeeking shared a relevant personal experience (thank you!). 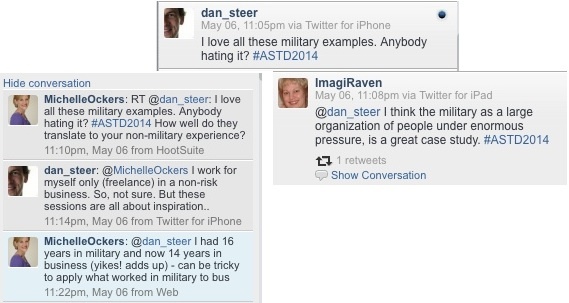 The first backchannel question was posed by @dan_steer at 11.05pm and I took my opportunity to join the conversation. I exchanged a few comments with Dan, but no-one joined in our thread. @ImagiRaven also replied to Dan. perhaps everyone else was too focussed on General McCarthy to join in the side discussion. It felt a bit like we were talking in class, albeit in a constructive way – helping each other to process information and think out loud. A good discussion helps me figure out what I think, so I enjoy using Twitter in this way. I only saw one other question posed in the backchannel during this session, which left me wondering whether all hash tagged tweets were actually appearing in my search (I was using Hootsuite on my MacBook Pro). The other thing I was waiting to see was sharing of additional relevant resources. These came towards the end of the session. Perhaps the speaker had mentioned them, or attendees had searched for them during the session. Either way, they were a useful addition to the ‘context’ of the session. I had a sense that the session was wrapping up from a flurry of comments on the standard of the presentation. I really appreciated @eGeeking advising the backchannel that the session had indeed ended, and letting us know how long the break was before the next session. So, how did I rate my backchannel experience against Mark Britz’s criterion? 1) Frequency – there were enough people tweeting that I was able to follow session progress, although there was a lot of redundancy in informational tweets. 2) Quality – although I was focussed as much on observing the backchannel process as I was on the session content, I still extracted some useful insights. For example, the crew resource management approach in aviation trains the crew (amongst other things) how to communicate in an emergency rather than precisely how to respond to every possible emergency (which is unachievable). The business application is to build communication skills and teamwork to help our people figure out a response to a range of situations. A more active backchannel discussion would have improved the quality of the experience and value of the content for me. 3) Context this was the most challenging of the criterion for the backchannel to meet. I couldn’t grab the corner and side pieces to start constructing the jigsaw. Even though it was easier to follow the session in chronological tweet order, I was still working hard cognitively to put the pieces together as I was given them; it helped that I was being given pieces that fitted close to each other. What did really help to provide the context was a mind map of the session blogged and tweeted very soon after it ended by @Quinnovator http://blog.learnlets.com/?p=3852. Ah! Now I had my corners and edges with some of the middle pieces thrown in too! This really helped to bring it together for me.